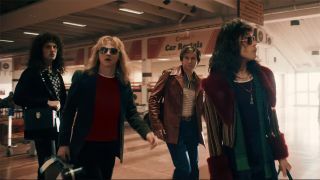 It’s fair to say that new Queen biopic Bohemian Rhapsody has taken the world by storm. It premiered at the end of October, went on general release in November, and has already gone on to become the biggest-selling music biopic of all time. Speaking last month, Queen guitarist Brian May hailed Rami Malek’s “remarkable” performance as Freddie Mercury and said it was deserving of an Oscar nomination. That may well come to pass, but ahead of those announcements, the 37-year-old actor has just been shortlisted for Best Performance By An Actor In A Motion Picture - Drama for the 2019 Golden Globe Awards. And that’s not all, the film has also been nominated in the Best Motion Picture - Drama category. Malek will be up against Bradley Cooper (A Star Is Born), Willem Dafoe (At Eternity’s Gate), Lucas Hedges (Boy Erased) and John David Washington (BlackKKKlansman). Bohemian Rhapsody will go head-to-head with Black Panther, BlacKKKlansman, If Beale Street Could Talk and A Star Is Born. The winners will be announced at the 76th Golden Globe Awards, which will take place at the Beverly Hilton, Beverly Hills, on January 6. Earlier this week, Queen and Adam Lambert announced they’d head out on the Rhapsody tour across North America in July and August next year.